For information about any of our Entertainment Group services call Cozette at (414) 316-5215 or email cozette.mclemore@runningrebels.org. A catered music service for weddings, family reunions, graduations, parties and some special events can be provided at an affordable rate through the Running Rebels Entertainment Group. Any type of music you want, we have. Need to create a logo or flyer? We can help you out! Have a catchy quote or artistic creation you want to see on T-Shirts? We can work with you to design shirts for any occasion. We offer videography and photography services for events. Our talent videographer or photographer will film and edit for you. Mission Statement: Splash Team is a youth led marketing and promotion team, which lends its services to businesses and companies in need of promotion. Our partners large networks, allow us to promote to a wide audience. Our services include flyers, postcards, banners, t-shirts, social media, and street team promotions. Running Rebels’ Catering is a full-service vendor serving the needs of the community with high-quality service and food, at an economical price. As a non-profit, a portion of the proceeds directly benefits the youth programming at our agency, as well as creates sustainable employment for adolescents and adults. We have quickly become a staple in the non-profit community providing catering for organizations such as Boys & Girls Clubs, WCS, and Safe & Sound. From business meeting to weddings, no job is too large or too small for our catering team. Let us customize an event for you. Rebels Catering offers a wide variety of menu items, if you are looking for something specific, please ask and allow us to customize a menu and pricing for your next event. Gluten-free, Vegan and Vegetarian options also available. Price includes food, plates, cups, utensils, and condiments. Delivery charges are included in per person rate (within 5 mile radius). Additional cost will be added for wire racks. Services available at additional rates: serving staff, venue set-up, clean-up, and table coverings. 50% deposit of total invoice required when booking. Cancellation of services must be received within 48 hours of event date. A restocking fee of $50.00 will be retained from the initial deposit. 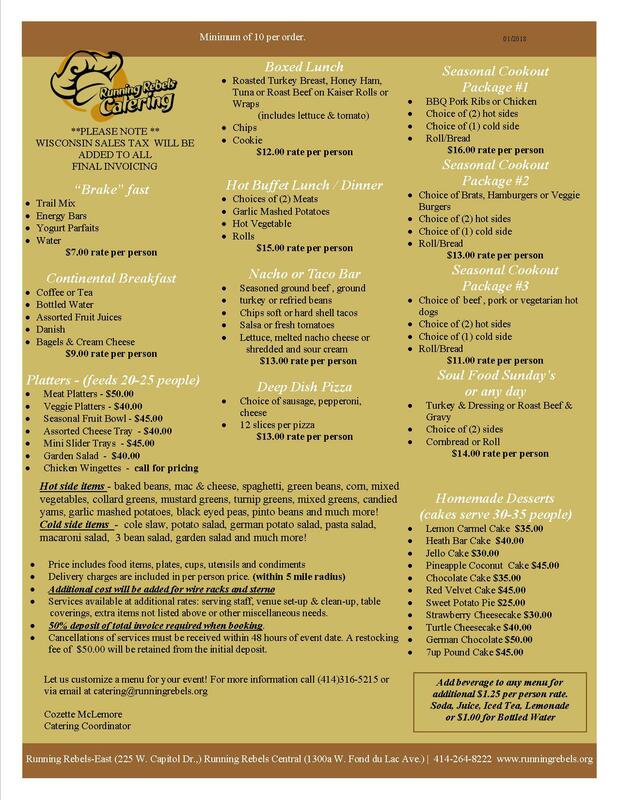 Let us customize a menu for your event! For more information call (414) 264-8222 to speak with our Catering Coordinator Cozette McLemore or email catering@runningrebels.org. Where: 1300 W. Fond du Lac Ave. In the summer and spring, items are placed outside. In the winter we still keep our resale going inside.